While Memorial Glade is often known as the “Berkeley Beach,” Crescent Lawn took its place in the spotlight on Friday, when students took to the lawn to sprawl out on its grass and on giant inflatables. Some listened to music and perused displayed art made by students. Others enjoyed screen printing or hula-hooping in the warm April sun. All were brought together by BAMFEST, which was hosted by the student committee of the Berkeley Art Museum & Pacific Film Archive, or BAMPFA, and served as an intersection of student life and student art. BAMFEST featured Berkeley student bands such as Wormfarmer and Mint Julep, as well as student DJs such as Yaseen and Kahj. Mint Julep’s Maya Morales blessed the lawn with her jazzy vocals on covers of everything from Britney Spears to Lake Street Dive. 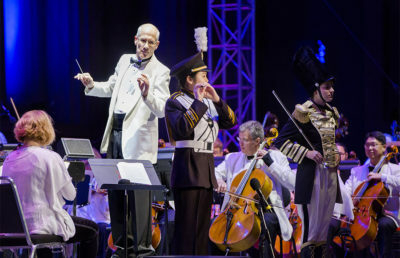 All of the music performed served as the perfect intersection of easy listening and engaging performance, and it was especially well-suited for an outdoor listening session. 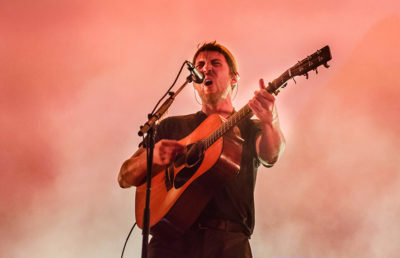 The music was upbeat and warm, ranging from covers of well-known songs to original tracks with laid-back, summery vibes. BAMPFA Student Committee co-chair Tina Kremzner-Hsing, a UC Berkeley sophomore who has been with the student committee for two years, said the goal of the event is to amplify the name and work of the BAMPFA Student Committee. The artwork was displayed on two huge, rectangular easels, located next to the screen printing station. Although the easels largely didn’t have a theme, one easel in particular was a meditation on space, displaying everything from minimalist graphic design to photographs of distant metropolises. From the crowded streets of Hong Kong and Taipei, photographed by Cherry Wu, to the quiet isolation of airplane seats, photographed by Vivian Wan, the photographs and other artwork served as the most cohesive board on display. Traditional gallery spaces serve as a vacuum for works on display, allowing curators an intense amount of power over the experience of the installations. When bringing artwork outside, those in the student committee gave up this control — and some of the more subtle pieces were lost as a result. These more intimate pieces were not fully successful in the harsh sunlight and busy outdoor environment, lacking the space for the contemplation they deserved. The art display found more success when the boards presented a more eclectic mix of pieces, incorporating unconventional mediums that may not be found inside a gallery. While battling against all the other stimuli of the afternoon, the displays found more cohesion in chaos than anything else. According to Sadlik, the sweater had been knitted by her grandmother in 1982 for her mother. Her mother wore it throughout Sadlik’s childhood. By the time it was passed down to Sadlik two years ago, it had become a “home sweater” with a hole in the elbow. Sadlik fixed the hole with a large black patch, which features an embroidered self-portrait she made. Other pieces included “Nothing Gold Can Stay” by Amanda Kachadoorian, in which Kachadoorian spray-painted a bouquet of artificial flowers gold, its accompanying identification placard displaying the famous Robert Frost poem from which the piece draws its name. By dealing less in subtleties and more in spectacles, artwork such as Kachadoorian’s did better in this space in grabbing the attention of passers-by. “Invert” by Gen Kasaneiwa took its shape in two 2-by-2-foot circles, one with a picture painted on it in negatives and the other entirely white. The posting by the piece requested the viewer look at the circle on the left for 10 seconds and then look at the right circle quickly to invert the picture and cause a change in perspective. Also on this easel were screen prints, photographs and small painted canvases. While “Invert” offered a change of perception within itself, each piece also offered entirely different experiences. Kremzner-Hsing said it was vital that all the artwork shown was from campus student artists. 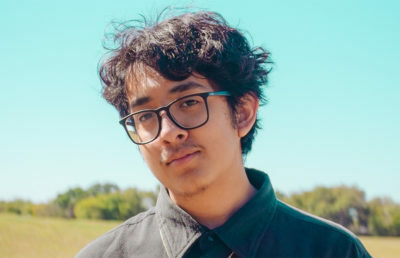 The BAMFEST subcommittee sought to represent a variety of subjects and mediums in the festival’s artwork, selecting student pieces that embodied this mission. This year, the BAMPFA student committee worked hand in hand with the museum to put on several events oriented toward student engagement and expression, BAMFEST being its final event of the spring semester. 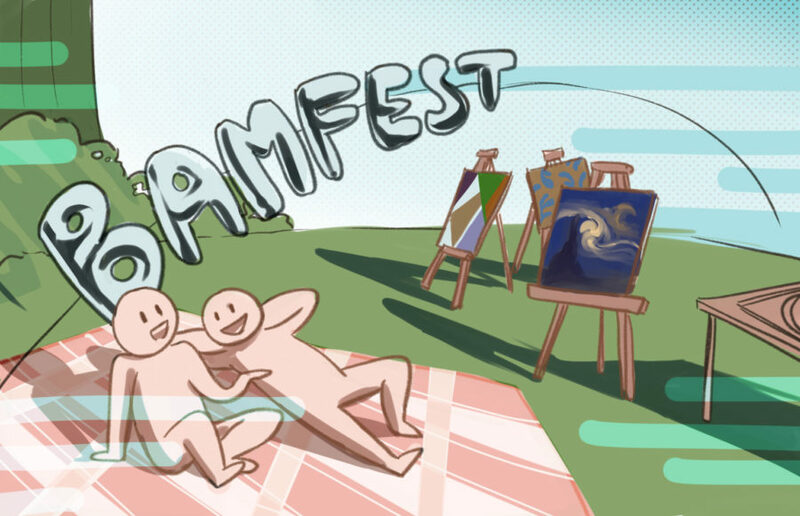 BAMFEST is another arts-oriented event by students and for students, put on by the student committee in what will hopefully become a staple of UC Berkeley student life. Kate Tinney is the assistant opinion editor. Contact Kate Tinney at [email protected].